Amidst the usual fireworks, shouting and all-round blatheration that accompanies the Budget, especially the last one before an election, it was interesting to see that, for once, charities had a glimmer of good news. Following the prosecution of banks last year for manipulating financial data in the Libor scandal, £75 million in fines was collected from the guilty parties. That money is going to a very worthwhile home. Military charities and other good causes will be receiving funds in sums that include £25 million to set up a fund to help older veterans--including, for the first time, those injured in nuclear tests. Meanwhile, the Essex & Herts, East Anglian, Welsh and Scottish air ambulances will all be getting money to allow them to buy new helicopters. Chancellor George Osborne said of the allocation of funds that it "took money from those who showed the worst values to support those who represented the best British values". I disagree with Gideon on most things, but for once he was, if you'll excuse the pun, right on the money. If only Osborne would clamp down on financial misdeeds more often, then perhaps we'd see more of this kind of thing. Meanwhile, the amount that can be claimed through Gift Aid is being significantly raised: from £5000 to £8000, beginning in April next year. This is a big deal for smaller charities, boosting their intake through collection tins and online fundraising by £3000 a year. For some, this could mean the difference between survival and rolling up the shutters. Let's not be too starry-eyed at Osborne's munificence, though. This government has been terrible for the Third Sector. Big claims for a partnership between the coalition and charities (hands up who remembers The Big Society) rapidly devolved into a situation where they were told to do more with less. The severe uptick in foodbank use is just one example where government policy has forced charities to pick up the pieces. The measures announced last week are welcome, but we shouldn't pretend that they're anything other than a politically-motivated handout. I don't believe that anyone in the Third Sector see this budget as anything other than a half-hearted attempt to curry favour. Whoever comes to power in May needs to do better by charities than this bunch of chancers. You may remember Greenpeace's Detox campaign, which named and shamed big fashion brands for their quite literal dirty laundry. It's all too easy for garment factories to dump toxic spill into the ground water of the communities of which they are part, rendering that water useless. It's estimated that over 60% of ground water in China is not fit for human consumption. The Detox campaign was key in getting a significant fraction of big fashion retailers to sign up to binding agreements to clean up their act by 2020. Nice as it would be to take it for granted that these companies will do as they are told, it make sense to check up on them. Hence the Detox Catwalk: an online platform specifically designed to monitor the big brands and their record on getting toxins out of the water that people use to drink and wash in. Transparency is the word, of course. Being upfront and honest about your processes makes it much more likely that you'll act ethically as a company. It's a positive feedback loop that, Greenpeace believes, is starting to show real results. "Increased supply chain transparency is good practice for sound chemical management, which will help decision makers draft and promote solid policies in China. Once companies are transparent, the public then has a chance to monitor what's happening in the industry - they have a chance to take part in the risk management of chemicals. In fact, it promotes good governance of this issue." publicity, have the desired effect. This radical-chic architecture echoes a larger force at work in the marketplace. Just as the environmental movement spawned greenwashing, the altruistic bent of the under-thirty-five generation has given rise to what you might call goodwashing. TOMS, a company that started out making canvas espadrilles, has built a half-billion-dollar-a-year business on its “One for One” marketing platform: for every pair of shoes you buy it donates a pair to a child in need. TOMS has given away more than ten million pairs and its shoe dumps have engendered some controversy, of the giving-a-man-a-fish-versus-teaching-him-to-fish variety. More important, it has inspired copycats. (See Skechers’s BOBS shoe collection, whose slogan is “Making a Difference for Kids” and whose marketing materials look like a Save the Children campaign.) Then there is Maiyet, the luxury leather and jewelry company born at Davos and sold at Barney’s, which employs artisans in the global South, pays them a living wage, and storytells the hell out of their narratives. TOMS has always fascinated me as a company, regardless of how ugly I find their shoes (spoiler: very). This very notion of baking a doubled production into your company's mission statement is bold to say the least, and it's clearly working if sales and the appearance of copycat lines from competitors is anything to go by. The slightly sneering attitude that the writer of the piece, Dana Goodyear, effects towards brands with stories seems a little short-sighted to me, and comes from someone that doesn't really know that much about ethical fashion. The truth is that there are hundreds of brands out there that put the stories of their workers front and centre on their websites and promotional material. It's a marketing ploy, of course, but there's a bit more to it than that. Ethical fashion has transparency at its heart, and part of that is knowing not just about where your clothes come from, but who makes them. Expressing an interest in the lives of a cotton farmer in India, or a seamstress in Bangladesh, or a finisher in China means that we as consumers are much more likely to empathise with their struggles, and want them to do better. Decent pay and conditions for fashion workers can come from an insistence on the part of the customer that the brands they buy do right by the people who provide them with the goods in the first place. Personally, I see nothing wrong with a brand that's prepared to show us the people that make our clothes. It means they have nothing to hide, no dodgy practices that drop costs but cause suffering. It's interesting that Dana Goodyear chooses to highlight Maiyet as a brand that 'storytells' its employees. The luxury market is rapidly rediscovering the notion of ancient skills and practices as a marketable commodity, and one that fits into high-end fashion in a fresh way. Look, for example, at Saigon Socialite, a footwear brand that blends traditional Vietnamese pagoda carving with luxury French leather to create stunning results. I think a brand that has a story to tell about the people it employs is a brand that has a little more to offer from both an ethical standpoint and in terms of attracting consumer interest. We all have that one article of clothing that has an interesting story attached. We like to talk about our clothes. Let's keep the discussion going. I am, it has to be said, something of a techie. I'm writing this piece on the move using an iPad connected to a Bluetooth keyboard, tethered wirelessly to the 3G on my obscure-brand Chinese smartphone to access the web. So, of course, people have been asking me what I think of the Apple Watch. That's an interesting question, and the Apple Watch is an interesting item. It's Apple's first move into the fashion arena, offering the must-have accessory of the spring/summer season. It comes in a huge range of prices and finishes, right up to a solid gold offering for £13K. Which seems a lot, until you actually look at what that money will get you for a gold watch in the current marketplace. In the world of luxury watches, thirteen grand is entry level. And those things only really tell the time. The most intriguing part of Apple's recent presentation that launched the Watch wasn't about that object of desire at all. It was about the way their mobile operating system, iOS, is entering into ever tighter integration with health and medical services, even to the point of gamifying research into diseases like Parkinson's. It's often difficult to get people to sign up for medical research. If you make it as easy as playing a game on your phone, your database of results (and hence their likely viability) will go through the roof. This is fascinating stuff, and opens up the notion of a wrist-worn computer (that, don't forget, has a built-in heart monitor) to all sorts of potential uses. A recent article in the Guardian put the case for the Apple Watch changing the way we donate and interact with charity and social issues. Take the humble charity wristband. They're a blazing success story, with millions sold every year. What if, instead of buying a band for your favourite charity, you could download a branded watchface instead? It would cost the same to buy, but the charity wouldn't have to pay for manufacturing and distribution. More money therefore goes to the cause you want to support. With location-based services very much at the heart of the modern mobile experience, the chance to be gently reminded about social issues when you're out and about comes into play. The Guardian uses the example of a nudge to sign a petition when you're near the obnoxious anti-homeless spikes that have been appearing on our streets, but maybe pop-ups when you're approaching your local Oxfam about their newest campaign could be a thing. Health tracking is a big part of the reason many people buy a smart watch, and there are all sorts of opportunities to use that information to do good things. Virtual marathons, for example, where you can donate the miles you walk or travel in a day towards a cause. This is already happening in places that support the BetterWorld initiative (like my hometown of Reading), where you can log your activity and exchange it for goods and services. Then, of course, there's the advantage of wearing a health tracker that can automatically contact the emergency services the moment it detects a problem. Of course, there are potential pitfalls to this new paradigm. No-one wants to be bombed with petition requests every fifty yards. Consent is key, as is the ability to easily adjust your preferences should you sign up to a service in a charitable flush only to find out that it really isn't what you expected or wanted. Clarity and transparency is key (as it should be in any charitable transaction) if you want your experience to be fun, rather than a chore. Or indeed, a privacy issue. It's early days for the technology, and we already have naysayers and critics unifying against Apple, before they even go on sale. Experienced observers have, of course, seen all this before, and you could fill an article with negative early reaction to the iPod, iPad and iPhone that tend to blur into one comment--no-one will want one. The opposite has usually been the case, to the point where Apple's designs aren't just ubiquitous, but massively influential. There's a reason phones all look the same these days. Although it would be foolish to predict the success of one product based on the performance of others, it feels likely that there will be a lot of people sporting an Apple Watch, or the Android equivalent, over the next few years. It will be fascinating to see how the move to a wrist-based way of looking at the world of information will change things. Let's hope that change is positive. Fashion trend forecaster Li Edelkoort has just used the Design Indaba conference in South Africa to announce her annual predictions for the year. In a move that's likely to shock many in the industry, she's declared that fashion is dead. "This is the end of a system called fashion and we will have to invent new ideas. For now I think we are going to concentrate on clothes; celebrate clothes. As a result we will see couture coming back, [versus creation] and in fact it's a sort of relief because many people are thinking it." Edelkoort is not a voice to ignore. Regularly voted as one of the fifty most influential voices in the field, her annual presentation is keenly awaited by trend-setters across the field. This is a bombshell, and cuts right to the heart of what's happening to the discipline she loves. She sees fashion as a field that is eating itself. Education focusses on teaching students to become catwalk designers, individual, isolated voices rather than collaborators and team players. Fashion journalism has become, for the most part, a cosy relationship between magazines and manufacturers, with marketing budgets the major contributor to coverage. Edelkoort looks with despair at a new wave of fashion bloggers, unaware or uncaring about journalistic ethics, that are all too happy to give positive reviews in exchange for samples and a free press pass. And then, of course, there are the looming ethical issues that have brought the dark side of fashion ever more regularly to the public's attention. When people are dying to make our clothes, something has to change. This is fascinating and provocative stuff, from a commentator that was up to now seen as part of the mainstream. It's going to be interesting to see the reaction to her presentation. Personally, it feels like a declaration of war. The t-shirt is, along with the blue jean and the sneaker, a truly iconic piece of 21st century fashion. They are so ubiquitous that we don't even really think of them as fashion items. They're just, well, there. We all have drawers full of the things. Sometimes, it seems like they just appear out of nowhere. An item as common and everyday as the t-shirt leads us to be complacent about its origins. We simply don't think about where they come from. They're cranked out by machine, right? Wrong. There's more to the humble t-shirt than meets the eye, and a recent pop-up in Leeds showed interested parties just how much work goes into something so simple. Antiform, a group of activists and makers, teamed up with TRANSFER, an joint initiative set up by the Centre For Sustainable Fashion, the University of Sheffield and the London College of Fashion to build a t-shirt factory. Over the course of a weekend last month, the public were invited in to see the processes involved in getting a t-shirt to the consumer. People were asked a series of questions, based on their buying habits. These questions formed the basis of a manufacturing docket. At the end of the day, participants could see the garment that they had unwittingly specified created in front of them: not by machine, but through the work of Antiform's skilled artisans. Cranking out four t-shirts an hour, observers were quickly made aware that the modern t-shirt is a complex garment, the end result of a myriad of different processes. TRANSFER hope that the event, and others like it that they plan to put on over the coming months, will help people to reconnect with the fashion that they buy and wear, and that they'll realise that there are skilled, hard-working craftspeople behind those items. A fascinating idea, and one that really brings some hard truths about the fashion industry home to us. We've talked about award-winning charity Gift Your Gear before, but it's always good to big up a friend of Pier32 when they're doing great work. Let's recap, in case you missed earlier bulletins. Gift Your Gear are a charity that takes in and retasks pre-owned clothing. Not so unusual, you might think. But GYG specialise in the retasking of outdoor clothing, whether that be jackets, waterproof trousers, or base layers. They even take equipment like tents and camping gear. These unwanted items are donated to UK community organisations, youth groups and charities working with young people in the outdoors. This is important work, especially with disadvantaged kids who might never have been out of the urban environment. These charities enable others to benefit from life changing experiences in the great outdoors, regardless of their circumstances. 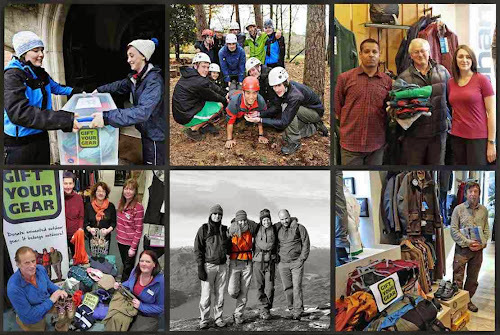 Over the past few years, over 300 groups have benefitted from the gift of gear. This year there are even more organisations set to gain from your good will, and the regret at buying that slightly too-tight pair of walking shorts. Gift Your Gear are teaming up with outdoor and travel clothing company Rohan this March to make the donation of your equipment and clothing a quick, easy and worthwhile process. If you have any outdoor gear that's cluttering up the wardrobe, you can do a spring clean and take it in to any of Rohan's shops across the country through the whole of March. You'll snag a 15% discount off anything you buy instore that day. Handily, Rohan have just launched their spring and summer range, so it's the perfect time to freshen up your walking gear as the weather starts to warm up. Outdoor gear belongs outdoors, so why wait? Have a dig around, and this spring gift your gear to people and charities that can really use it!